Periodically throughout Passions for Nature: Nineteenth-Century America's Aesthetics of Alienation (2013), Rochelle Johnson shifts her aim from the intelligentsia of nineteenth-century America to the academy of twenty-first century America, whose "pursuit of reason tends to dismiss the physicality of nature altogether." She doesn't name names (these are her colleagues, after all), but it doesn't take much reading between the lines (or beyond the book) to deduce that she's talking about that species of scholar who would announce the nature of nature as a "social construct." Poststructuralism has become a hammer, and there's pretty much nothing left on the planet that doesn't look to the catechized academic like a nail. Most adherents of poststructuralist thought argue that nature's meaning is culturally constructed ... Proponents of this view suggest that we can not understand nature beyond our cultural and ideological blinders because all we have are those blinders ... Nature cannot have any "truth," "meaning," or "inherent value," according to this line of thought, because all truth, meaning, and value must be mediated by the human mind and, therefore, by culture. Other theorists argue, however, than an emphasis of the cultural constructedness of environmental understanding aggrandizes humanity at the expense of the physical world ... In the words of Onno Oerlemans, the risk of what has been called the "ecopoststructuralist" position is "ultimately erasing the materiality of nature through a kind of ontopomorphism in which human subjectivity and discourse become the sole reality." I'm sure Oerlemans wouldn't need it pointed out to him that for expediency's sake he commits an ontopomorphic error in his formulation of the ecopoststructuralist folly: discourse can no more erode the materiality of our world than can changes to scientific nomenclature affect the physical status of the trans-Neptunian object we call "Pluto." What actually suffers is our ability to to apprehend the world beyond human culture and its artifacts. In a strictly utilitarian sense, it dampens our receptiveness to feedback from "wild" systems, inhibiting our ability as an aggregate to respond in a timely fashion to climactic or ecological tide shifts brought about by human activity (and overpopulation). From an intellectual, aesthetic, or even spiritual standpoint (take your pick), it amounts to the droughting of human experience, the loss of our capacity to look beyond ourselves. Some months ago I found and flipped through a book called Warhol's Nature (2015), published as the catalog for an exhibition of the same name held at the Crystal Bridges Museum of American Art in Arkansas. Earlier this week I felt compelled to revisit it. I was especially interested in taking another look at the essay submitted by one Michael Jay McClure, Associate Professor Art History at the University of Wisconsin-Madison. Let's take a quick look. The following excerpt consists of paragraphs two through four of Professor McClure's essay "I Made It Through the Wilderness," and contains an object lesson in what Johnson means when she refers to "ecopostructuralism" and what Oerlemans is getting at when he alludes to "ontopomorphism." [W]ith Warhol, we can almost hear a rising chorus repeating the refrain "Unnatural!" from those who would hurl the epithet at him for being gay to those who would want art to be authentic (whatever that means). Even his greatest champions might call him preternatural, supernatural, spectacular, or, best of all, fabulous. But natural? Never. Yet terms that seem obvious might not be so upon closer scrutiny. Nature has never been what rests merely "out there" but has been thought to course through us, personally. Philosophers and art historians have long taken to task the idea of ungoverned nature——or wild terrain. To be sure, there are places that are dangerous, uninhabited by humans, or remote, but those places are not untouched by convention. They exist as conceptually, and culturally, imagined. The woods and the wild, for instance, appear in almost every fairy tale; they wend through Shakespeare plays, are framed by palatial European gardens, or stand as subject and border in landscape painting and horror films. The point, then, is that nature (and its more forthrightly political counterparts: the frontier, the savage jungle, the undiscovered country, the dark continent) exists as much as a concept as an actual place. Thus, there may be no "wild" entirely separate from our apprehension of it. What should interest us about Warhol is the idea of mediated nature, compounded with the idea of nature as that which is inside of us. To that end, when we speak of "our natures" we imply a wilderness dwelling and governing from within. Nature, then, presents two unlighted masses of enigma: one topographical, one psychological and behavioral. 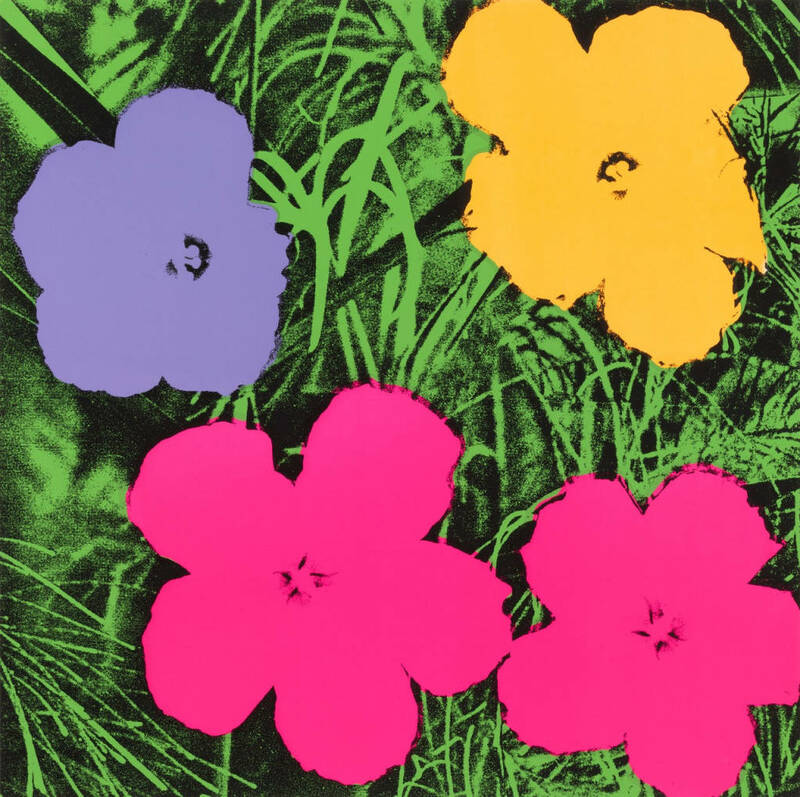 How might nature, as idea and as personal landscape, evidence itself in the work of Warhol? Before I start finding fault with this, some credit where it's deserved: McClure is is absolutely correct about the definition of the word "nature" being far from obvious. As we've seen before, none of us (well, certainly none of us Anglophones) are really sure what "nature" means, what it is, and what it isn't. Five hundred years of linguistic and cultural evolution have left us with a word warped beyond all usefulness, and deconstructing "nature" and its myriad referents is a necessary step towards putting our affairs on this planet in order. Nature, then, as a dynamic process. Nature, then, not as a wilderness that we need to merely get through or fear, but as volatile matter and attendant activities that may shelter us, keep shining, or explode even yet. —is facile at best and fatuous at worst. It's airheaded to abstract from the living Earth its "ebbs and flows" and associated principles of dynamism and movement and then to proclaim this is what's crucial, this is what's really there. Of paramount importance to any understanding of life on Earth qua life on Earth is an appreciation for particularity. Anyone who vents words about "nature" (in the sense of ecological process&relations or of the biosphere) and isn't concerned about specifics doesn't even know that they don't know what they're talking about. 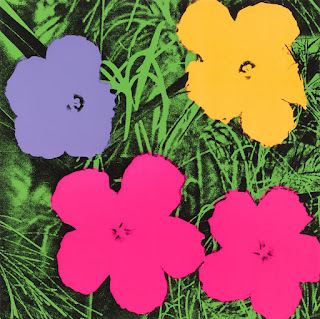 Nowhere in the piece does McClure bother to specify what kind of flowers are in Warhol's Flowers series—though he does deem it necessary to state, for the record, that the bottles in another famous series are Coca-Cola bottles, and the cans in another are Campbell's Soup cans. Using our culture's fudged semiotics regarding "nature" as a predicate for boiling "nature" down to some pithy principles of rhythm that require no reference to any particular entities or communities is a neat trick of inductive reasoning, but it ultimately serves to obfuscate fact in service of anthropocentric navel-gazing. Such a perspective reduces in our reckoning everything on Earth beyond human culture and its products to an undifferentiated, ahistorical green sludge. 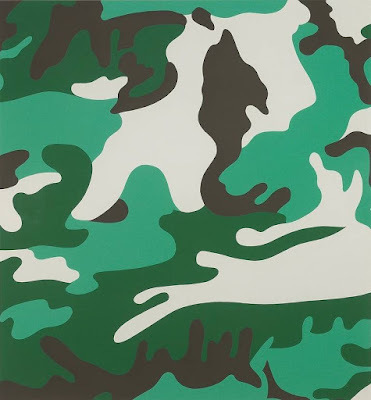 [T]he work in this exhibition catalogues Pop bombast alongside subtlety and evanescence: not just in the pristine rendering of an eruption, but in the fleeting shimmer of Silver Clouds, the gleaming and semi-transparent matter of Camouflage, or the finely stratified images of populations on the verge of vanishing. Further, these fragile effects ask for a commensurate activity among its spectators. Simply, to see these effects would require us to heighten our sensitivity, to slow down and consider this natural matter, its secrets and complexity, with care. Available on 1stdibs for a mere $25,000. Returning to the preamble—where McClure describes how "philosophers and art historians have long taken to task the idea of ungoverned nature"—we witness self-gratifying anthropocentrism in full swagger. Notice how he envelopes nature within humanity rather than contextualizing humanity within the global ecosystem. Humanity is of the Earth, and it is a part of the Earth: our conceptual exile from "nature," our alienation from the biomes and unmanaged cycles on which our settlements are overlaid (and upon which their continued existence depends) is a consequence of our exploitation of "nature," and of our methods of exploitation. This alienation motivates McClure's framing of "nature" as something in humanity, and not the reverse, and McClure's framing reifies the paradigm of estrangement. But it's in stating that "wild" places "exist as culturally, and conceptually, imagined" that McClure earns his ecopoststructuralist, neo-scholasticist bona fides. In a couple of sentences he summarily dismisses the value of those parts of the world in which humanity isn't actively running bulldozers, laying pipelines, raising cell towers, or sipping Starbucks lattes. The material existence of such places—their life, ecology, and diversity, their history and particulars—are far less important in McClure's view than the impression the ideas of such places has made upon human culture and its products. To him, the corporeal Amazon rainforest and our ideas about the Amazon rainforest occupy an equal amount of cosmic real estate. Thought presses with as much weight upon the scale as substance. If McClure wished to make the point that our secondhand knowledge and bodies of cultural lore regarding remote, unanthropized places must necessarily have a greater influence upon (most of) us than our direct experience of them, he presumably would have done so. He might have written something like: "the woods and the wild of film and literature are our culture's primary informants of such places, and therefore when we refer to them we unavoidably speak of a conflation of social construction and of the independent material facts informing that construction." Instead, he writes: "nature...exists as much as a concept as an actual place. Thus, there may be no 'wild' entirely separate from our apprehension of it." To be sure, the quote marks around "wild" are significant. McClure probably doesn't mean to suggest that the world outside our mechanized cities only exist as the result of our belief that it's out there. However, it is the belief in which he invests value. Nature is meaningful insofar as it is internalized by humanity. "Those places," McClure writes, referring to remote, unanthropized regions, "are not untouched by convention." I'm rather more concerned about how they are not untouched by the toxic metabolism of civilization. If we spent more time and effort paying attention to and engaging with those non-human, ungoverned elements of our own environs—yes, even in the city, even in the suburbs—and perhaps less time looking in the mirror, playing with our toys, and writing thinkpieces about our mirrors and toys*—we'd have more of an appreciation for particularity and ungoverned process, and be more capable of accurately imagining what's "out there" and all that our global apparatuses of production and consumption directly endanger. (I wonder if Warhol would have been so cavalier in his grotesque glorification of capitalism's cultural runoff if he understood what was actually at stake.) In making a perfectly rational case for why our mirrors and toys are what we should be paying attention to because they're all we're capable of knowing, thinkers like McClure demonstrate the academic's susceptibility to intellectual photokeratitis in an overscrupulous pursuit of reason. I am persuaded that in the end democracy diverts the imagination from all that is external to man, and fixes it on man alone. Democratic nations may amuse themselves for a while with considering the productions of nature; but they are only excited in reality by a survey of themselves. * Not that I'm not as guilty as anyone else.